Exceptional landscapers Charleston SC style! What does Charleston Plantworks offer? Exceptional landscape design, landscaping & landscapers Charleston SC style! Only Charleston Plantworks offers native, sustainable, & renewable Charleston landscaping and landscape design services. Our landscaping company guarantee to you? We will return if you are not satisfied with our Charleston landscaping services for any reason! Landscapers Charleston SC style means installation experience with native trees, shrubs and hardscapes. Our Charleston landscapers will artistically place trees, shrubs, and flowers in your gardens. Landscaper installation of large palm & live oak trees require specialized horticultural knowledge and the proper tree equipment. Charleston irrigation systems and sod installation should have detailed plans for drainage and soil conditioning. Irrigation systems should include programming and automation of drip and spray zones. Irrigation systems are built with sustainable landscaping practices including water reclamation from rainwater and drainage. We also offer irrigation system maintenance, cleaning and repair services. Our landscapers at Charleston Plantworks specialize in building and installing water features, ponds and waterfalls for that dramatic backyard landscaping effect. Charleston Plantworks also builds patios, walkways and custom hardscapes. 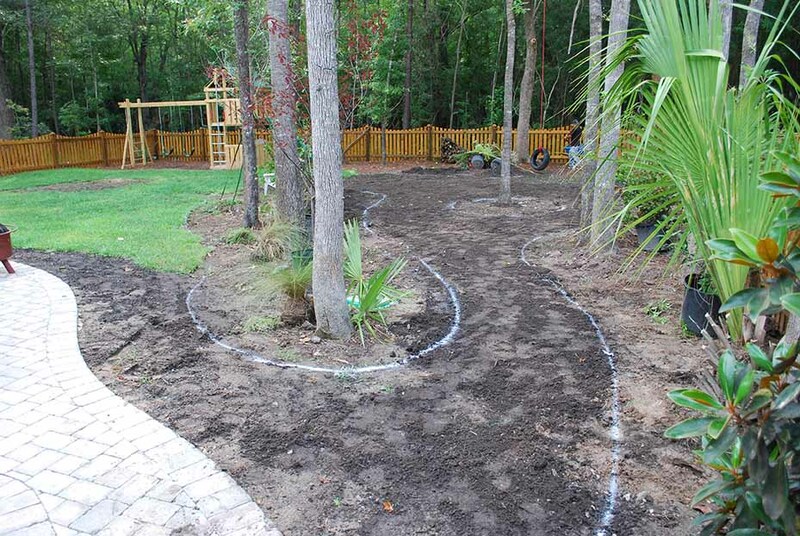 Landscapers Charleston SC style means exceptional landscaping services with the reliability and service you expect. Charleston Plantworks and their landscaper experts automatically adjust landscaping maintenance plans by the season. For problem areas, our horticulturist can diagnose landscape problems and recommend solutions, disease prevention and control plans. We are Charleston Plantworks – Exceptional landscapers Charleston SC style! Call (843) 579-1033 or email info@charlestonplantworks.com to discuss your landscaping ideas and our installation services. - Break down your large landscaping project into smaller and more managable projects such as sod in the backyard, flower beds in the front yard and a privacy hedge on the right side of the house. - Plan landscaping projects by season such as installing large trees and shrubs in the spring or fall.